In an environmental sampling study carried out in 44 schools in Taiwan an increase in fungal spores in the air was associated with worsening asthma. The rate of asthma in children (6-15 years) in Taiwan has risen from 6% to 11% in 10 years. Surveying 7,154 children in 264 classrooms across Taiwan, Chi-Hsien Chen and colleagues found 11.7% had physician-diagnosed asthma, 7.5% had current asthma and 3.1% had asthma that improved at weekends and holidays. Of those with current asthma, 41% reported relief of symptoms during weekends. Hierarchical logistic regression modeling found the level of Aspergillus/Penicillium spores, total ascospores and basidospores to be associated with current asthma, and total spores also to be associated with asthma symptoms that improved at weekends and holidays. Lifetime prevalence of physician-diagnosed asthma was not associated with any fungal spores. Classrooms with visible mould on the walls had higher Aspergillus/Penicillium and basidiospores in the air. Air sampling in the classrooms at head height in the morning with the windows open found 2,181 fungal spores of 23 recognisable morphologies. Geometric mean spores counts were 366 for ascopsores, 49 for Aspergillus/Penicillium spores (they are indistinguishable) and 318 for basidiospores. 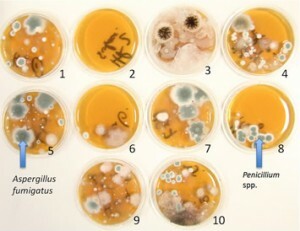 The most common airborne spores were Cladosporium, with lower amounts in classrooms with mould visible. Skin prick testing for allergy was not done. To account for home exposure, information of visible mould at home was collected and adjusted in the regression models used. shared by other fungi, notably the closely related Penicillium species. There are now approximately 20,000 to 25,000 species of basidiomycetes identified worldwide, most of which come from mushrooms, puffballs, or bracket fungi, and, thus, they are abundant in outdoor air. However over 5 million fungi are thought to be on earth, most not identified. This well-designed and exhaustive study confirms previous studies demonstrating that spores of Aspergillus and Penicillium are significantly associated with current childhood asthma and ‘asthma with symptoms reduced on holidays or weekends’. Furthermore, this study is the first to demonstrate that basidiospores are an asthma-inducing factor.